I was reading your blog entry – “Open Source Has Grown Up. Shouldn’t We?” – and would like to publish it in Enterprise Open Source Magazine (http://opensource.sys-con.com/). I would like run it on our Web site as well. Let me know if you would be interested in giving us permission to publish it. No problem. All the content that I have written, including this post, is licensed under the Apache License. See the page “Licenses” at the top of my blog. This should give you the permission you need. If it doesn’t , then you have it by this note. I’m not an attorney, but my reading of the license says you just have to indicate I am the copyright owner, but not to worry. Though I hope we may meet some day, in won’t be in court. Not bad. Deftly written, with a light touch and even a little humor at the end. (a) means Nancy will have to include a copy of the License on her web site. And if she were to fix even one typo when she posts my blog entry, then (b) comes into play and she has to post a “prominent notice” that I screwed up. Which means it is much easier to blog about open-source than to actually do it. The above copyright notice shall be included in all copies or substantial portions of the Software. There we go. Nancy just has to copy the copyright notice. Off she goes. Or should she? Or should you? I suggest we stay around, to see if we can all agree about what I just did. Have I actually created a new license? And whether or not I have, is it still an “open-source” license? Can I make this decision myself, or do I have to get someone’s blessing? Or, put another way, if I have in fact departed from the norm, do I need someone or some group that can, in the words of the Bard, “license my departure”? We will get into that. But before we do, this incident is yet another reminder that open-source is not as simple as so many people make it. You have to keep your thinking cap on. Most importantly, you need to avoid addressing each situation with sweeping generalities. Each situation must be addressed on a case-by-case basis; see Make or Buy?. We’ll be looking at this issue in forthcoming posts, but in order to finish this one off and let Nancy do what she wants to do, suffice it to say that I decided to re-license the blog from just Apache 2 to using a dual-license approach, either Apache 2 or a new license, which I called the TWIT License. But if you think about it, Nancy never got this far. She’s already updating her site. She got all she needed some time back. What was it? And you thought open-source was simple. So did I at one time, but now I know better. By the way, if you’re going to follow this thread, then you might want to keep a pot of coffee on hand.You should also have some milk and sugar on hand. Because, as you shall learn, we’re going to be looking at a license that literally contains “sugar,” but a special kind of sugar, one that has left a bitter taste in some people’s mouths — and I’m going to milk this for all its worth. That fellow is a fellow of much license. Measure for Measure, III, ii, 195. We continue our occasional series of posts on the Sun/FSF alliance and the release of Java as open-source by looking at the process of language definition and standardization, and the role of testing in enforcing conformance to a language specification. Open-source is closely associated with open standards. For example, Linux implements the POSIX standards that were created around Unix, and the Apache HTTPD server implements the key standards associated with HTML. Usually the implementor has some freedom of action, and one of the great appeals of open-source is the opportunity to affords to use that freedom to innovate on top of open-standards. For example, I use the Amarok program to play my digitally-encoded music on my SuSE box. There are many such players but I’ve found Amarok works the best for me. Amarok relies on code from others to play mp3 files as well asflac files . I prefer flac since it is based on an open-standard, while mp3 is encumbered by patents. However, Java is much more precisely defined, in the form of the Java Language Specification (JLS) and the Java Virtual Machine Specificatinon (JMS). These are precisely written and are also available under a license that lets you implment the specifications. This of course made the job of writing a Java compiler a well-defined task. Our compiler, Jikes, takes as input source programs written in Java and produces as output files in a precisely-defined format called “class files” that serves as the input to the Java virtual machine. Philippe Charles and I were very careful from the start of our project to never exposed ourself to any of the source-code from Sun or to any of the tests that we new Sun had produced, and which were available to IBM under its license from Sun. Accordinly, we relied on such tests as we could put together, and were also one of the first users of the “Modena” test suite. However, once word got out that we would be releasing Jikes in binary form at IBM’ alphaWorks site, we were instructed that IBM did not want to release any Java-based technology that did not conform to the applicable standards, and we were thus told we had to pass Sun’s tests before we could release the code, and were granted access to the test suite. In those days it was called the JCK (Java Compatability Kit). We weren’t concerned with the virtual machine tests, only with the compiler tests. There were two key parts. The “b” tests tested for diagnosing errors; that is, each test had one or more errors and to pass the test was to recognize these errors. By the way, though Jikes is perhaps best known for its speed, I think its greatest strength is in the quality of the error messages. Philippe’s Ph.D. these was in the area of parsing, and his two major advances were (1) to advance the state of the art in compressing the tables that drove the parse, and (2) to provide code that, given the grammar as input, would automatically generated code that would detect and repair errors. We used Philippe’s parser-generator as part of the Jikes work. It was released as part of the Jikes work, under the name JikesPG. It is also the parser-generator used by Eclipse’s Java parser. One indication of its quality is that JikesPG was able to accept the Java grammar exactly as it was written in the JLS. We noticed in a later release of the JLS that the grammar had been changed. The new grammar accepted the same language; the changes were made so Sun’s own parser-generator could process the grammar. The “c” tests tests consists of correct programs and to pass the test was to compile the source, execute the resulting program, and produce the same results. It took us a few weeks to pass the “c” tests. As I recall the tests uncovered about as many errors in Jikes as Jikes uncovered in the tests. I did all the testing thereafter , and I spent thousands of hours from early 1997 to the end of 1999 running the “c” tests. It was fortunate that Jikes was so fast, as it routinely compiled the tests about 10 times faster than Sun’s own compiler, javac. Indeed, the standard demo I spent when showing Jikes at conferences during 1999 was to have two windows open, one compiling the tests using Jikes, the other using Javac, as the difference in speed was easy to see. That test suites tend to mimic the behavior of what is being tested is a well-known phenomenon in the world of testing. For example, perhaps the best book ever written about the C programming language is the classic C: A Reference Manual by Samuel Harbison and Guy Steele (the same Steele who is also one of the authors of the JLS). It reflects the work they back in the 1980’s while at Tartan Labs. I recall an anecdote about their experience; perhaps it can be found in the book or perhaps I heard it elsewhere. Their first version attempted to reflect the language spec as precisely as possible. However, they started getting complaints from users who were getting different results using the standard Unix C compiler. They tracked the problems down, and realized the differences were due to a number of bugs in the Unix compiler, so they then modified their compiler to have precisely the same bugs so compiler programs would exhibit the same behavior. Why does Jikes reject a program that another compiler accepts, or accept one that it rejects? You may find that Jikes accepts a program that another compiler rejects (or can’t compile), or rejects programs that another compiler accepts. Each version of Jikes represents our best effort at the proper interpretation of the language specification. Although Jikes is designed to work with all but the earliest versions of the JDK, we make no claim that any particular version supports precisely the same language as any particular version of the JDK. Since some products are designed to work with specific versions of the JDK, the compilers associated with them may not always recognize the same programs as Jikes. This section contains some examples of issues related to interpreting the specification. The first extra semicolon is erroneous, the second is allowed by section 7.6. Jikes treats each as cause to issue a warning. You can use the -nowarn option to suppress this (and other) warnings, or, even better, you can use your editor to delete those extra semicolons. This was the most frequently reported problem when Jikes first appeared. It took several months to confirm that Jikes was right all along. See Query #2 to Sun for the full story. By the way, “Query to Sun” refers to a series of posts we made to Sun about the language spec. These and many other documents were once available on the web, but are no longer so. However, the Notes database containing them is still around and I will endeavor to have the documents made web-accessible. The best example I have ever seen in the design and implementation of a programming language is Ada. The effort began in the mid 1970’s when the U.S. Department of Defense (DOD)realized that their vendors were using scores of different programming languages, and, thanks mainly to some visionary leadership, DOD undertake an effort to create a new programming language that would meet their needs. Ada was unveiled to the public in 1982 in the form of a joint announcement that the compiler was available, as were the tests, and the compiler had passed all the tests. DOD then set up a group to supervise the language standard going forward. I believe it was called the ARB (Ada Review Board). It was the final arbiter on language specification as well as any proposed language changes. The key people from the NYU team went on to found a company called ACT (Advanced Compiler Technologies). They translated the compiler into Ada and it has become the industry standard. It is licensed under the GPL. But is one until now untold story from the Jikes day that really brought home to me the importance of testing in maintaining an implementation’s conformance to a specification. Sometime well after Jikes had been released in open-source form I was approached by a group at IBM. They had been approached by a vendor. The vendor said they were acting on behalf of a client, and that the client wanted a commercial license to the Jikes source code, as it stood just before the release as open-source. I pointed out this didn’t make much sense, since the code was freely available, but the vendor persisted, as they wanted to be able to build a commercial offering on top of the Jikes code. I then pointed out that even if they did get code in its state when it was released then they would be unable to make use any of the bug fixes that had been received from our contributors, since those fixes came to us via the open-source process. They persisted, and there were a few more calls. Finally, the senior IBMer involved said they were welcome to the code, so long as they agreed to make no changes that would cause their product to fail any of the compatability tests. We never heard from them again — that was the last call. Now I am well aware of the Sun/FSF alliance and the recent announcements of Java as open-source –though I think they prefer to call it “free software.” But I don’t know all the details. I think some code has been released, some more has been promised. For example, supposed you get the code and compile it on Linux. How will you know you got it right without testing? Perhaps you have some secret sauce, but the only way I know to find out is to run tests. I’m hoping in my ignorance that Sun has already vowed to release all these tests. If so, I congratulate them. If not, we shall see if Sun is up to the test. This post is a slightly-edited trip report I wrote following my participation in the Licensing and Policy Summit for Software Sharing in Higher Education conference in Indianapolis in mid-October. I’ll speak more about it in future posts. Dan Greenstein, the co-chair, from the University of Caliifornia was unable to attend, so Bradley Wheeler, CIO of the University of Indiana (all campuses) led the conference. I confirmed with Brad that all the conference discussions are open. I took almost 20 pages of notes, and will post them to the conference portal soon. Brad volunteered the services of Tina Howard, a technical writer on the staff of IU, to take notes and help organize the conference discussions. I offered my help to Tina in answering any questions she might have about open-source, as she is new to this area. I also took along a digital camera, and handed it to Brad Thursday after lunch, suggesting he might want to take some pictures. He did; I will post them to flickr shortly and then post the URL’s to the portal. There are two key open-source projects in this area currently underway. Both are enterprise-level applications: Sakai for course management, and Kuali for managing a university’s financial operations. There were only two commercial firms represented: IBM and rsmart.com, a firm that provides services and support for Sakai and Kuali, and which is also is playing a key role in development. Key figures here are Chris Coppola from rsmart (Kuali) and Joseph Hardin from University of Michigan (Sakai). There was representation from the following universities: Indiana University (all campuses), University of California (all campuses), MIT, University of Michigan (Paul Courant, former provost was present along with Joe Hardin), Cornell and Penn State. Over a third of the attendees were attorneys. There were also many folks involved in technology transfer and university operations. Cliff Schmidt of the Apache Software Foundation was present Wednesday night and all day Thursday. His input was greatly appreciated. I individually spoke during the conference with all the folks named above, as well as most of the other attendees. Most of the conference was about very specific issues related to Contributor License Agreements (CLA’s) and providing some statements about patents in the open-source license for Sakai and Kuali. The CLA used to date has been that used by Apache It has been accepted by about 6 universities, including Indiana and Stanford, but both UC (University of California, all campuses) and MIT requested that additional language be included before they would approve. These changes have been accepted. The language is similar, and relates to the following problem. Existing CLA’s (in my view) are directed towards two groups: the open-source developers who write and maintain the code, and the corporations who contribute open-source code or use open-source code in their products (IBM does both). The developers just want some assurance they won’t be sued. The companies want to be comfortable using open-source code in their products. The open-source folks recognize the need for a more rigorous review process; that is a price they must pay to get more corporations to use their code and also to get those corporations to help contribute their own developers to repair and refine the code. d) Faculty have a more complex relationship. Indeed this is the main concern. Faculty by tradition and also in most cases “by policy” have their own rights to their work. For example, an English professor who writes a book gets the proceeds of its sales. EE and Computer Science professors have asked for similar rights for the code they write; and in some cases have gotten the same rights. “Policy” is especially tricky in that university policy is “black letter policy,” based on explicit documents that in some cases are over a hundred years old. Revising these documents is a very non-trivial process, one not to be undertaken lightly. All this is made more complicated by the special value associated with patents in the area of genetics, pharmaceuticals and bioengineering. And it gets even more complicated because universities are more and more focusing on the money to be made via technology transfer, and so some are less willing to make their work available in as open a form as has been the norm in the past. The net of the added language — as I can best recall — from UC and MIT is to say the contributions are not from the institution but from the contributors as individuals. 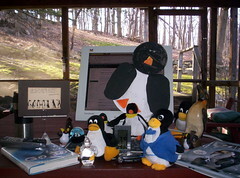 There was some discussion of revising policy to define the notion of a “enterprise software box,” by which is meant that faculty would have to agree that the university reserved the right to license their patnets for use in open-source code being developed by the university and jointly with other universities for their own purposes, as is the case with Sakai and Kuali. Both UC and MIT agreed to attempt some policy revision, though this is by no means easy. For example, UC may have to deal with over 165,000 signed agreements in effect with various faculty members in the past and present. Cliff Schmidt, the “legal advisor/member” of the Apache Software Foundation (ASF) was present all day Thursday. He is not an attorney but specializes in legal issues on behalf of ASF. He mentioned they were in the process of revising their CLA, and might be amenable to adding language suitable for academic contributions. That is, ASF might add language that would apply only to academic contributions, so the changes wouldn’t affect the existing language for corporate contributions. However, he did say it was unlikely such changes would be put into effect before mid-2007. The universites had already agreed before the meeting to try to move to the Apache License 2 if possible. Some of their current work is licensed under the Educational Community License, the ECL: http://www.opensource.org/licenses/ecl1.php. As an aside, I pointed out ECL that in my personal view ECL is incompatible with Apache V2, BSD, or MIT because of the requirement to give, “Notice of any changes or modifications to the Original Work, including the date the changes were made.” (The PERL Artistic license has similar language.) Many seemed surprised by this observation. Brad Wheeler, the chair, sent the attorneys out of the room Friday morning to see if they could come up with some actual language, as all agreed it was hard to discuss how to best proceed without some actual language at hand. They labored for just over an hour (I timed them) and returned to say they had come to an agreement, but were unwilling to share the language until they had had a chance to review it with their own organizations. There were a few votes and such taken during the discussion. I made a point of abstaining from any vote as I didn’t think it proper for me on behalf of IBM to participate in this way. I did participate in the discussion, particularly in some aspects of open-source and project management where I sensed that the folks involved had limited experience, but I made clear when the conference started that I would only be giving my own views based on my experience, and should not be perceived as offering any official views from IBM. There was a consensus reached near the end of the meeting that it was important to have some patent-related language in the outbound license. The ECL license doesn’t have any. When I pointed out that they were providing a very high level of Due Diligence — one that went beyond that which might be needed for commercial entitiies to use their code, as the code was primarily meant for use just by their own and other universities — they said it was important to have a very rigorous process so they call sell their work to the university CFO’s and Chancellors. 4) That, since ASF changes might not be available until mid-2007, the community might proceed by revising ECL and seeking approval from the Open Source Initiatve (OSI) for approval of the revised ECL. The revised ECL would be a substantial revision; indeed, it would be basically just Apache 2 with language added to make it acceptable to the academic community, at least that part of the community developing enterprise-level applications for its own use. I told the group as a whole that many of the folks involved in managing IBM’s Open Source activities were located in Westchester and I would be happy to arrange informal meetngs, both with Research or to meet on an informal basis with some of our attorneys. Barnaby Gibson from ithaka is based in NYC, and while we were chatting when waiting for our flight to board said he might take me up on the offer. Friday morning I sat between Randy Metcalfe of OSS-Watch, an open-source information provided based in the U.K., and Jacqueline Ewenstein, an attorney from Mellon. I will try to build a relationship with Randy; I can already tell by the incoming searches to my blog that he has started reading it. I congratulated Jacqueline, Ira Fuchs, and Don Waters from Mellon for their support of the conference. A highlight of the trip was meeting Paul Courant from University of Michigan. He is a wonderful and very wise man, and I was especially pleased to learn, when I asked him if he was any relation to Richard Courant, that he was his grandson. I asked Brad to take a picture of the two of us and plan to post it on my blog soon. I spent almost twenty years at the Courant Institute of Mathematical Sciences (CIMS), the world’s foremost school of applied mathematics, a reputation due principally to Richard Courant and the many of the colleagues from Germany he enlisted to join him when he fled Nazi Germany to find a new life. I almost crossed paths with Paul in that he worked he summer of ’66 as a computer operator and I came to CIMS in early September of that year. While waiting for my return flight I learned that Matthew Raskoff of Ithaca is from New Rochelle, which I knew was the home of Richard Courant any many of his CIMS colleagues, including Kurt Friedrichs. Matthew said he was a good friend of one of Kurt’s sons. I mentioned I had had Kurt as one of my professors. My most vivid memory of him is that one morning back in the 60’s when we was into his 80’s I saw him waiting impatiently for the elevator to arrive. He just couldn’t bear to wait an extra minute or two to get to his office so he could start work on mathematics! My thanks to Brad Wheeler of Indiana University who sought IBM participation, and to Mike King of IBM for inviting me to participate in the conference last week in Indiana. It was a great honor and privilege to be able to attend. Here’s a short course on the lessons I’ve learned from my involvement in several major corporate announcements about open-source. Don’t underestimate the communication folks. Their job is to explain technology, strategy and your company to the public. The good ones are very good at it. Don’t think your detailed knowledge of the technology gives you an edge, or that many folks really care that much about the technology. The announce is trying to paint a big picture, so you don’t want to get mired in detail. These announcements are directed to reporters for major newspapers, industry-related web sites and industry analysts. Corporate communications folks are very good at this. They key point is that to the open-source community it doesn’t really matter what you do say and long as you DO NOT SAY certain things. Our developers look forward to directing the community to implement some of the good ideas they have come up with but haven’t yet had time to do. We are still working on the governance model. This is the largest open-source contribution in … Avoid phrases such as “last decade” or “in the history of open-source” or “the history of the universe.” It’s not your code anymore, so who cares? If you can, try to arrange to have some real open-source folks around. It also helps if your own open-source folks can spread the word within the community. It’s tough being a blogger and open-source developer. As a blogger you labor in obscurity. As an open-source developer you probably labor in penury. Even worse, attempts to escape penury may expose you to calumny. Dr. Fleury is not alone in thinking there is something wrong about making money using open-source. I noted similar sentiments voiced during the recent announce of the Sun/FSF alliance, endorsing the use of the gpl license because it wouldn’t allow corporations to “fork” the code and create commercial derivatives. This is a misunderstanding of the term “fork,” but that a topic best left to a future post. As those active in the open-source arena know, there are two broad camps: the “free software” folks and the “open-source” folks. I’m in the latter camp, and so take my instructions from the Open Source Initiative (OSI). OSI is dedicated to managing and proposing the Open Source Definition (OSD). The OSI has no objection to using open-source code in commercial offerings. For example, the Apache License explicitly allows corporations, or anyone else for that matter, to use their code and modify it without imposing any requirement that the modifications must be made public. IBM is not alone is using open-source code in this fashion. Other companies do it as well, including Dr. Fleury’s new employer, Red Hat. As does MySQL.com, which licenses their code under both the GPL and a commercial license. Indeed they can be viewed as a commercial entity that uses the freely-available GPL-licensed version as a come-on to encourage customers to acquire the commercial version. But, irony of ironies, Dr. Fleury should be the last to argue that it’s wrong to make money off open-source. After all he has made oodles of boodle by selling his open-source based company to Red Hat. He probably even made enough so he can afford a comfortable upper-middle class lifestyle. Other companies strive both to make a profit and support open-source. A good example is Collab.net’s funding of much of the development cost of Subversion. Once I built a railroad package, I made it run, made it race against time. Once I built a railroad package; now it’s done. Brother, can you spare a dime? Let’s lend it, spend it, send it rolling along! How about it, Brother Fleury? I am not seeking any of your oodles of boodle — I have enough dimes so I can both put food on the table and also work on the Open Source Volunteers project on my own time, so I suggest you might want to consider sending some of your money “rolling along” to the good folks at the Apache Software Foundation? In a previous post, Make or buy? Home, sweet home — on the web, I argued that the most important decision facing a corporation considering starting a major open-source project is whether to build a community from scratch or buy into an existing community. Sometimes there is no choice since there is no suitable existing community. But if there is a suitable existing community then I think it is better to join that community than to build a new one from scratch. That to me is the most surprising aspect of the SUN/FSF alliance and the recent announcement of the release of Java in open-source form under gplv2. Why didn’t Sun leverage the existing Apache and Eclipse communities? Now of course this was Sun’s decision to make, so I’m offering these thoughts here just to shed some insight on the various options that come into play when making this sort of choice. But I expect the following announcement would have had a greater impact, and would have made a favorable outcome more likely. We have decided to make Java open-source. We seek to make it available to the widest possible audience, under a license compatible with existing open-source efforts around Java. Accordingly, we are handing it over lock, stock and barrel to the Apache Software Foundation (ASF). We look forward to working with the ASF to make Java a truly open platform. 1. Sun made some noises about offering Java for ECMA standardization in late 1999. I decided to no longer work on Java when this fell though, believing then that Sun would make no meaningful effort towards making Java more open for the forseeable future. Suppose you work for corporation that has on hand code that for strategic reasons it wants to release in open-source form, and you are asked to provide some guidance. 1. Make. Make the community from scratch, providing all the resources to establish the project web site, market the project, attract developers, establish a release model, convince people of your good intentions, convince people you will follow the open-source rules, and so on, and so on. 2. Buy. Buy into an existing community, turning the code over to them and providing your developers not as project managers but as assistants to the managers of the existing community. I’m a strong believer in the second approach. You want to buy into an existing community, the best such community you can find. You want to leverage that community to establish your project. I say this because I’ve been there, and done that. Let me tell you about it, the story of Cloudscape/Derby. Go to your favorite search engine and search for “apache database”. Within seconds you will see the word “Derby.” I like being able to say this — I spent almost four months of my life spending every spare moment I could to help make it happen. I said no. However, I had heard about Cloudscape (CS, which I’ll use hereafter as that’s what I used for months in e-mails, in part to disguise the project’s purpose) before. In early 1999 I was invited to discuss Jikes at a Java user’s group meeting in NYC. One of the speakers who went before me was from a start-up called CS. Their product, CS, was a browser plugin written in Java. In those days before the arrival of the high-speed internet the page update time was significant, and CS was created to speed up the manipulation and analysis of data, as follows. Data manipulation and analysis was done on the client machine by first downloading the data from the web and saving it into cached memory. The CS software was a relational database system that allowed the full use of SQL to retrieve data as well as various graphical tools to display the results. This greatly speeded up analysis. I learned a few hours later that my colleague was right. I got an e-mail from the CS team saying they had been told to open-source the code and so wanted some guidance on how to navigate IBM’s open-source process. I soon learned from the team that the CS startup had been acquired by Informix and that the CS code had come to IBM when IBM acquired Informix. CS had matured into a high-quality piece of code — a “relational database in a Java jar file” was the simplest summary. If you added that jar file to your Java classpath, then you had full access to a relational database that had a full implementation of SQL and also met the ACID-test. CS had once been a separate product, and had also once been the reference implementation for the corresponding Java database spec. Though it was no longer marketed separately, it was now one of the most widely-used components in IBM software, and was embedded in scores of IBM’s products. It was production-level code, the real deal. The initial plan of the team was to start a new entity, perhaps based on the eclipse model. Let’s call that approach CS.ORG. The team felt this would allow them to build a community gradually, perhaps even shape the pace of development, develop tie-ins with IBM’s products as the code became more accepted, and so on. It was a real opportunity — great code that filled a gap that hadn’t yet been met, that of a relational database in a jar file, as well as skilled developers on hand to show the community how the code worked. There were also backing from management, and so on. Everything was coming up roses. It was just a matter of execution. But there was a problem, a big problem. The code was big, very big. When we published Jikes it was just under 90,000 lines of C++. It took two programmers three years, or six programmer/years, to put that code together, at a cost to IBM of at least $1.5M. That works out to about $100/line. I did a study of the size of open-source packages back in the Jikes days. There were very few packages over 100,000 lines. This seems reasonable It takes at least a few thousand lines of infrastructure for almost any meaningful program, and when you add code that actually does something, you find that most open-source packages are in the range of 10-30 thousand lines. With two programmers you can make it up near a hundred thousand lines or so, though the way in which open-source packages are organized favors componentization. These estimates are for C or C++. Java programs tend to be larger; for example, there are more statements needed to manage namespaces, and there is a requirement that each class must have its own file. Suffice it to say that most open-source developers — save those who have spent quite some time working on the Linux kernel — have no experience working with code bases of a million lines or so.This meant that the plan of the team to slowly build a community while IBM retained clear control, hoping that developers willing to take on a million-line code base would come forth, was a dream, most likely a pipe dream. I also felt that while CS.ORG might seem a good place to start, one should look ahead to the end-game. Where would you most like to be after three to five years? So within a few days I started sending e-mails and making calls, suggesting that IBM’s best approach would be to hand the code over to ASF. What made this hard was that I knew IBM couldn’t just make a token donation, but that we would have to hand over the code lock, stock and barrel, making clear we were entrusting the code to Apache’s capable hands going forward, and that while we would be around to help as they deemed fit, we fully appreciated that from the get-go the code would be theirs, and no longer ours. To maintain any control at all you must give up all control. The transfer can succeed only if all accept and understand that the ownership of the code has changed, and that the creators no longer direct the effort, but are now available only to advise and help, as requested. I was not the only one to argue that giving the code to ASF was the best course. Others also felt the same, including folks with a lot more clout than me. I’m presenting the arguments I made and I can’t claim these arguments were decisive, but I do hope they provide some insight. In any event, the decision to release via ASF was reached in early July, and the contribution to ASF was was publicly announced at LinuxWorld in early August. We need a sheriff, someone trusted on both sides of the firewall. Our developers our good, but they are inexperienced in open-source, so there may be some mistakes, and we need someone on hand who can sort out the mess. That’s how Ken Coar got his current job. Note that the key decision was not what license to use, but how to build a community. Once you know that then the choice of a license is a tactical decision. For example, with ASF we had to use the Apache license. 1. IBM’s public statements said the code was worth about $70M. I was told it the code was about a million lines. I recall doing a count and finding from 800-1000 kloc. I did a download of Derby just now and found fewer lines, though I can’t say I counted them all correctly. Suffice it to say the code was indeed big by open-source standards. 2. The programmers both had Ph.D.’s in computer science, though not everyone would consider that an advantage. However you count it, Philippe and I can jointly say we convinced IBM to invest at least $2M or so into open-source by funding our work on Jikes. We are grateful for their trust. I’ve spent some time recently coming to grips with the new economic reality. It takes a chunk of a billion dollars to live a comfortable upper-middle class life style, as reported in the post Make my day. My attempts to respond with an attempt at humor have apparently caught the attention of the editors of the New York Times, and they have fired a new salvo over my bow. A decade into the practice of medicine, still striving to become “a well regarded physician-scientist,” Robert H. Glassman concluded that he was not making enough money. So he answered an ad in the New England Journal of Medicine from a business consulting firm hiring doctors. And today, after moving on to Wall Street as an adviser on medical investments, he is a multimillionaire. He (Dr. Glasman) won’t say just how much he earns now on Wall Street or his current net worth. But compensation experts, among them Johnson Associates, say the annual income of those in his position is easily in the seven figures and net worth often rises to more than $20 million. Indeed, doctors have become so interested in the business side of medicine that more than 40 medical schools have added, over the last 20 years, an optional fifth year of schooling for those who want to earn an M.B.A. degree as well as an M.D. Some go directly to Wall Street or into health care management without ever practicing medicine. Next time I fly in the coach section I will look for Mr. Moon, so he can let me struggle with first class, though I expect by that time he’ll probably have his own jet. Leigh Anne Tuohy grew up with a firm set of belief about black people but shed them for another — and you could tell exactly how it happened, except to ay, “I married a man who doesn’t know his own color.” Her father, a United States Marshal based in Memphis, reaised her to fear and loathe blacks as much as he did. The moment the courts ordered the Memphis City Schools integrated in 1973, he pulled her out of public school and put her into the newly founded Briarcrest Christian School, where she became a student it its first year. “I was raised in a very racist household,” she says. Yet by the time Michael Oher arrived at Briarcrest, Leigh Anne Tuohy didn’t see anything odd or even awkward in taking him in hand. This child was new; he had no clothes; he had no warm place to stay over Thanksgiving. For Lord’s sake, he was walking to school in the snow in shorts, when school was out of sssion, on the off chance he could get into the gym and keep warm. Of course she took him out and bought him some clothes. It struck others as perhaps a bit aggressively philanthropic; for Leigh Anne, clothing a child was just what you did if you had the resources. She had done this sort of thing before and would do it again. “God gives people money to see how you’re going to handle it,” she says. And she intended to prove she knew how to handle it. Dr. Fleury forgets to say he once worked for Sun. JBoss, a division of Red Hat, pioneered the disruptive Professional Open Source model, which combines the best of the open source and proprietary software worlds to make open source a safe choice for the enterprise and give CIOs peace of mind. I was apparently under the mistaken impression that the efforts of the Linux community over the last fifteen years, as well as those of the Apache Software Foundation over the last decade, were professional. But his efforts are not in vain; indeed he has given his name to a new word: fleuridation. 1. Michael Lewis is one of my favorite authors. See especially “Liar’s Poker,” one of the great books about the Wall Street boom of the 1990’s; “The New, New Thing:A Silicon Valley Story,” about James Clark, co-founder of Netscape; and “Coach: Lessons on the Game of Life,” one of the best books ever written about the NFL.